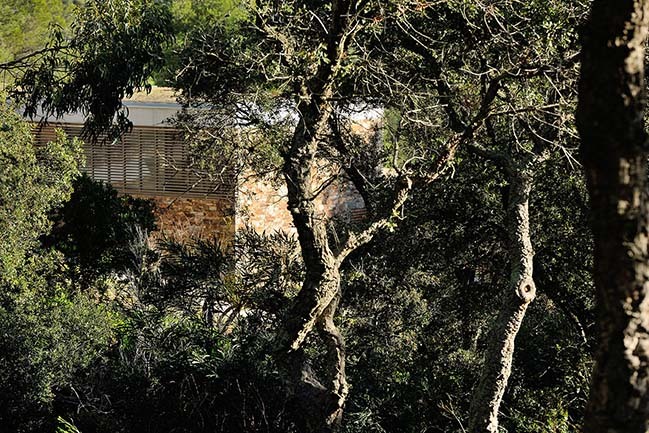 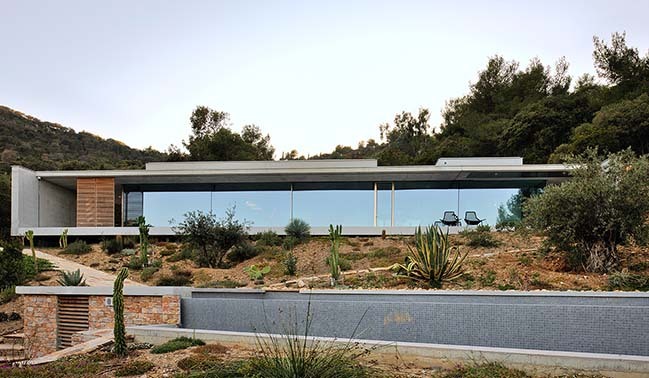 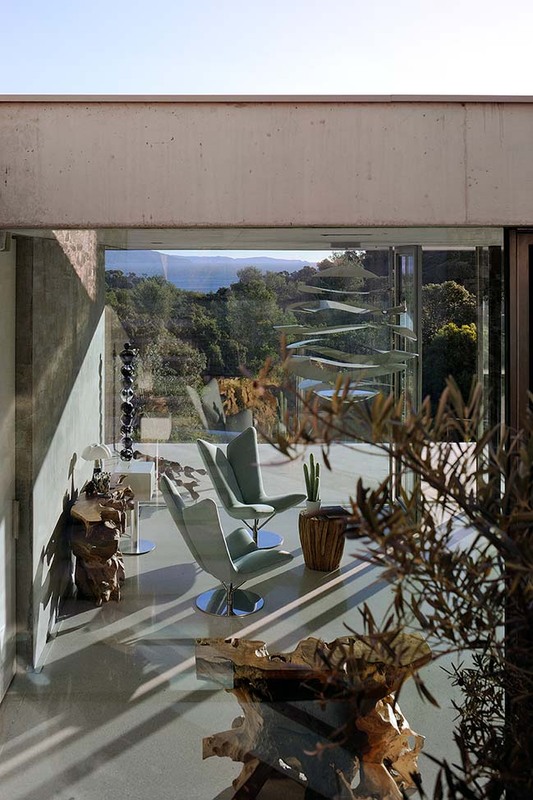 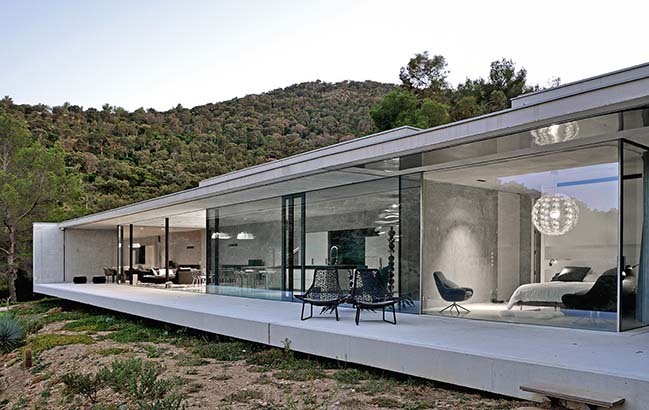 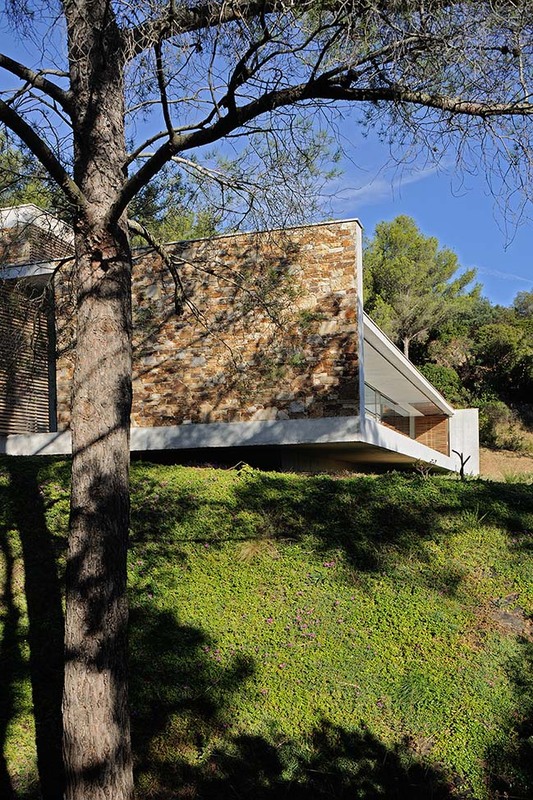 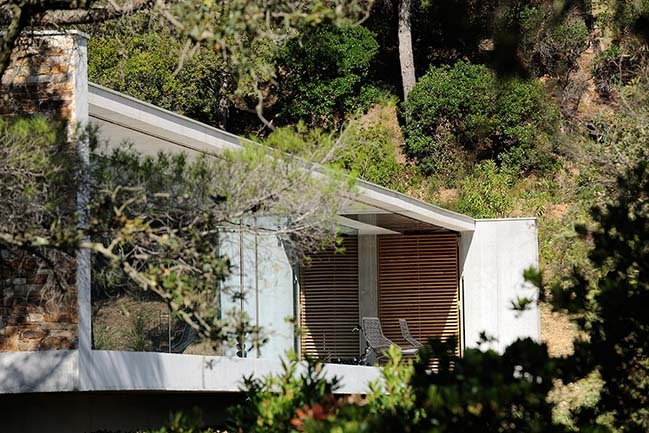 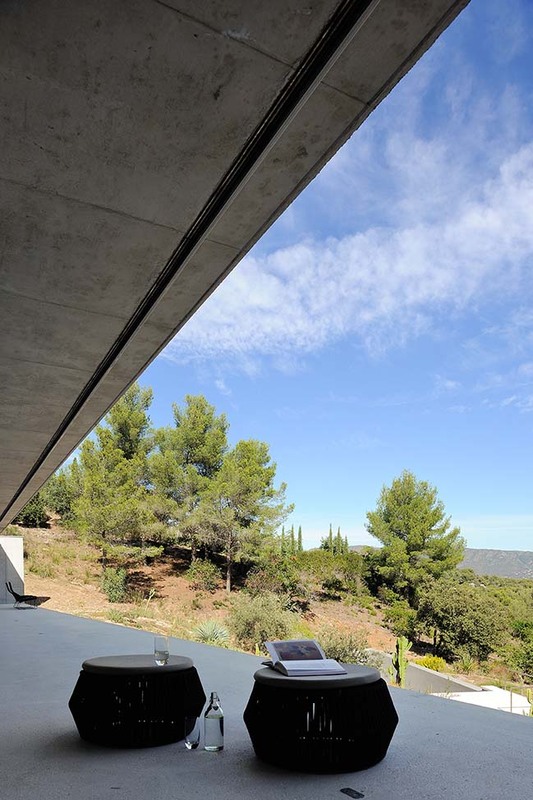 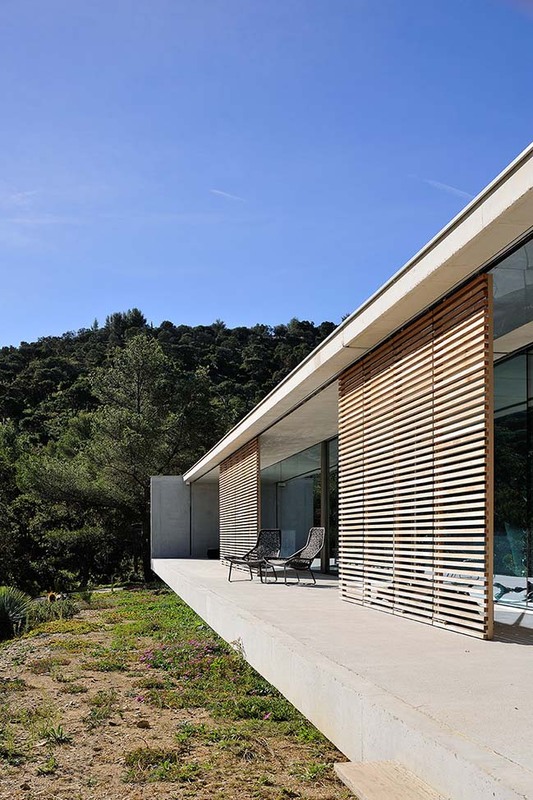 La Mira Ra house, located in the South of France, is the fruit of a long reflection about the marriage of the wild nature of the Mediterranean and the minimalist purity of contemporary architecture - a marriage resulting in a unique architectural project. 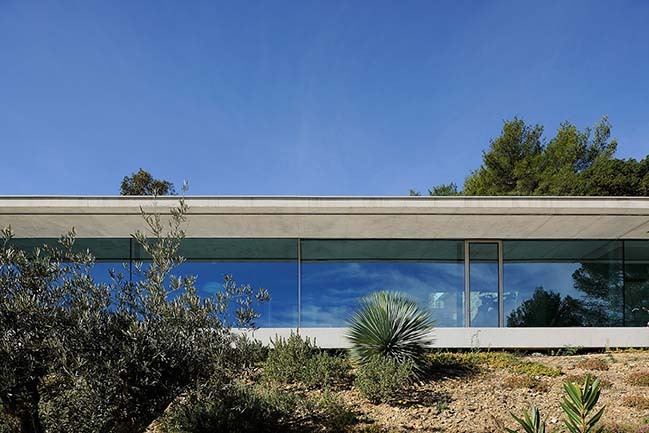 Realized between 2015 and 2017 by Pierre Minassian and his team of architects, today the house offers its inhabitants an intimate opening towards the sea. 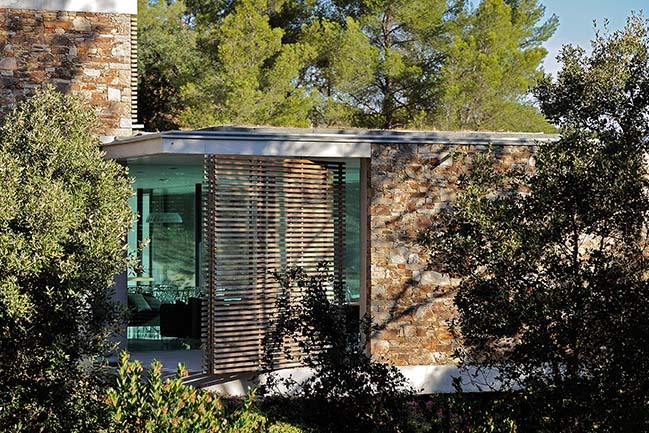 From the architect: The integration of the project in its environment and their cohabitation were the two key elements in the design of the project. 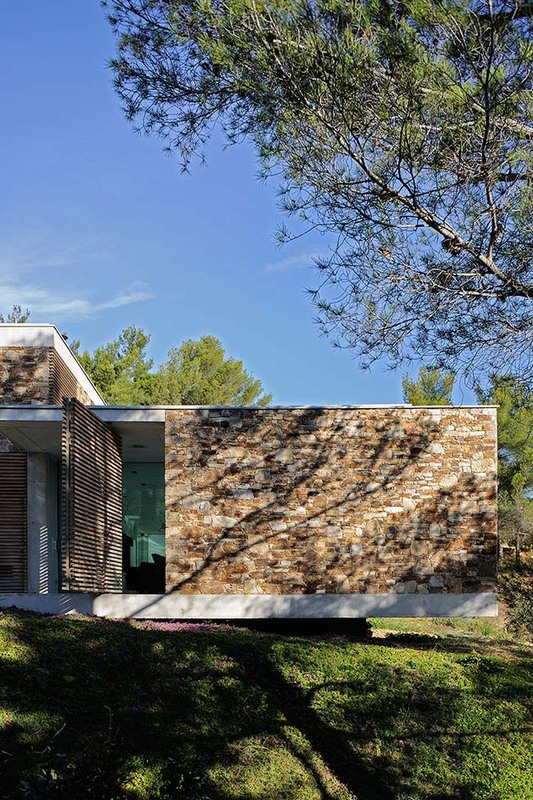 Located in a classified site, this private domain is under the obligation to include the use of the local stone in all its constructions. 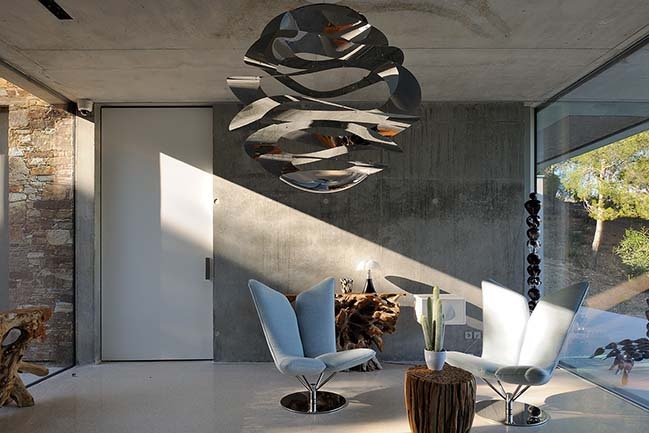 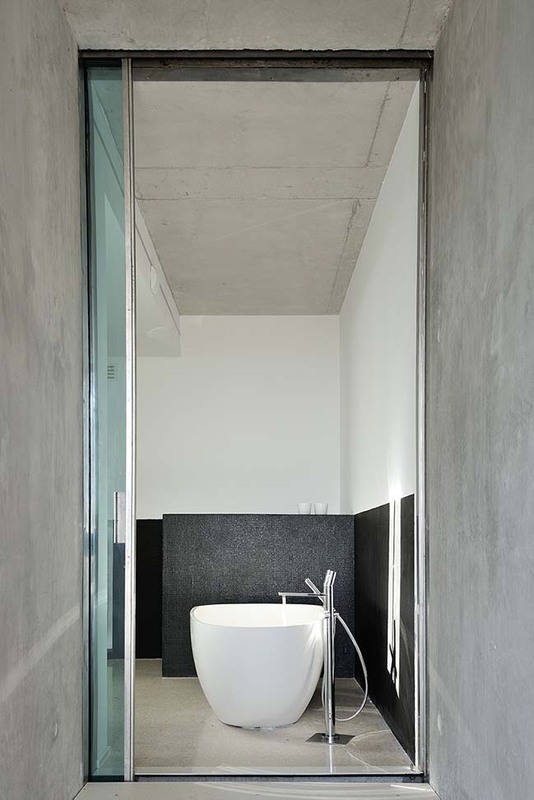 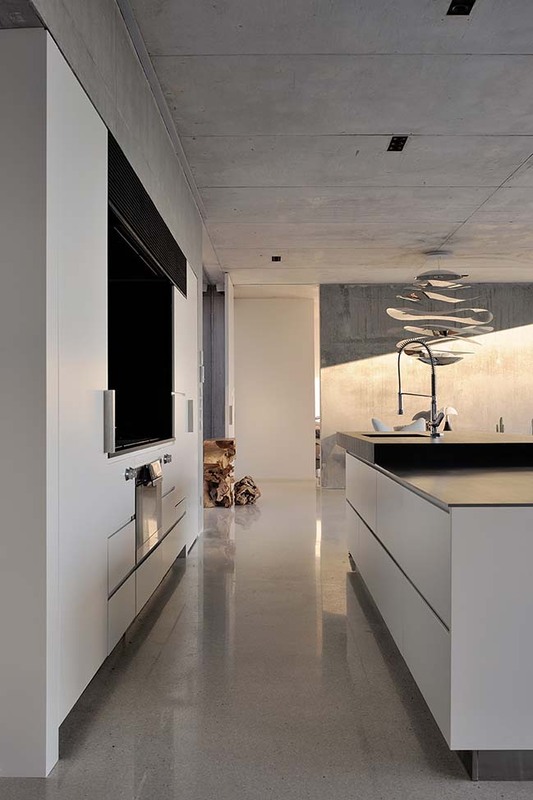 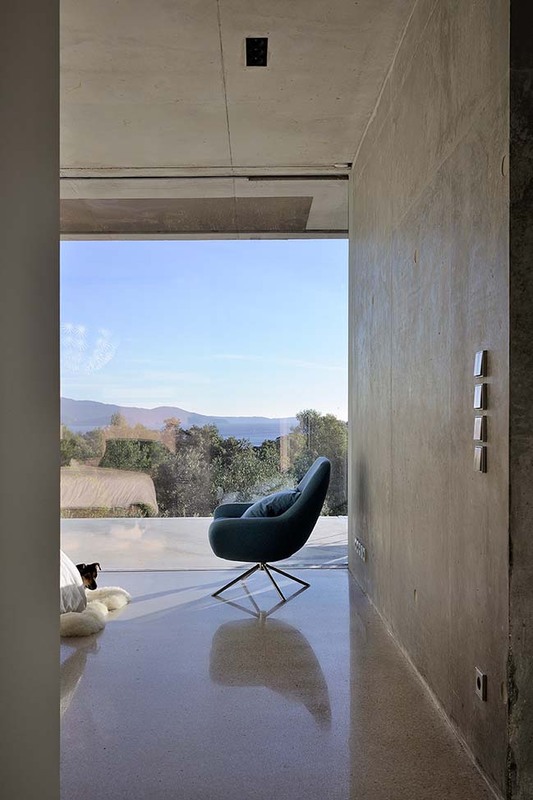 This requirement coupled with the love of the architect for the peacefulness of the raw concrete give birth to a poetic embrace of the two materials. 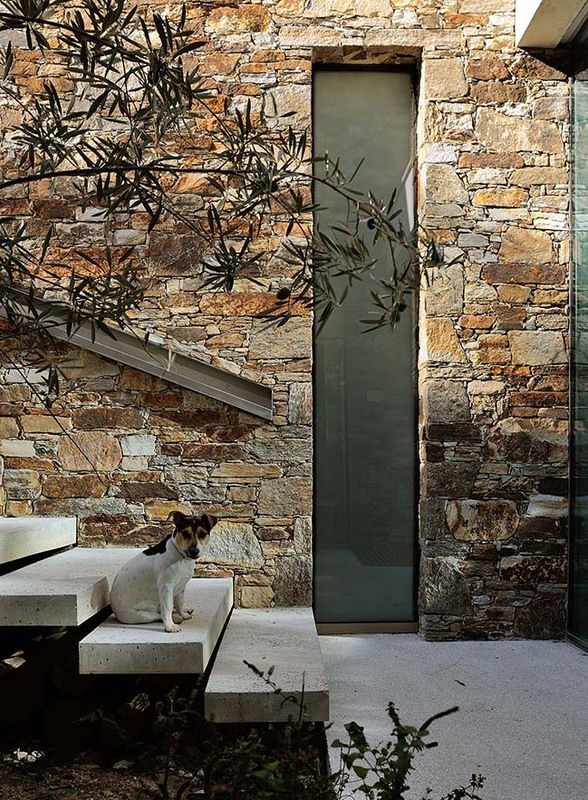 The stone finds its place by wrapping the house from the outside so as to melt it in its rocky environment. 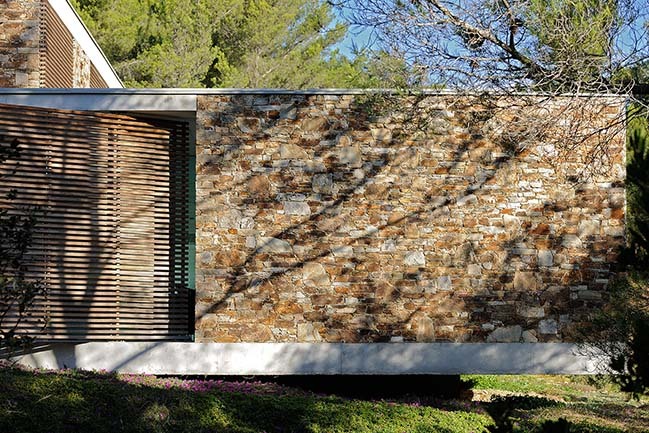 This is done so not only thanks to the rocks’ palette of colors close to that of the soil it lays upon but also by reflecting the sun's rays with a warm glow. 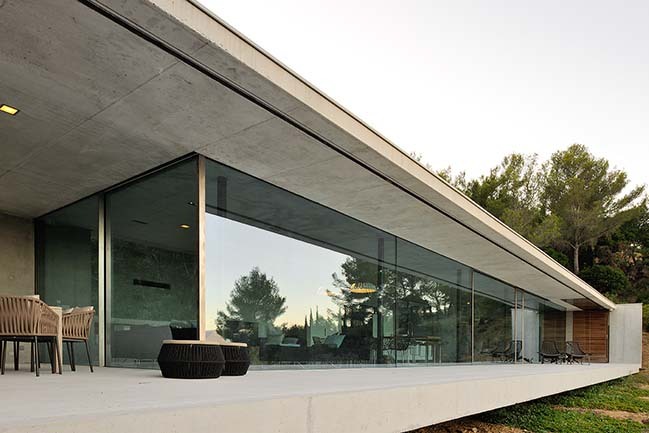 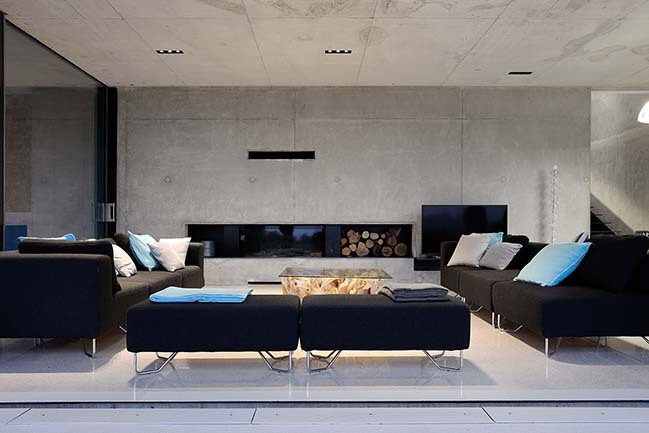 The inner shell is made of raw concrete aiming to create a sober and calm atmosphere. 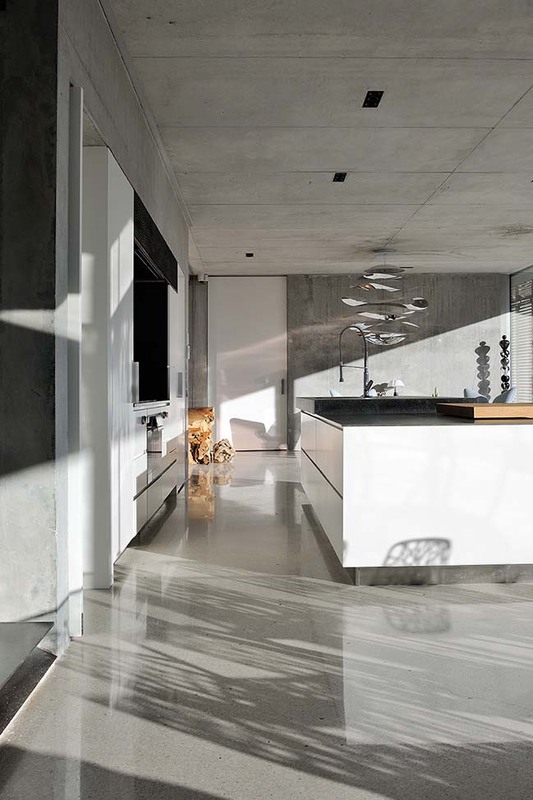 At the same time its’ smooth skin reflects perfectly the light rays penetrating into the house at sunset.By leaving the walls and ceiling naked the architect lets the raw concrete reveal its quirks - each surface proudly carries its own peculiarities and irregularities. 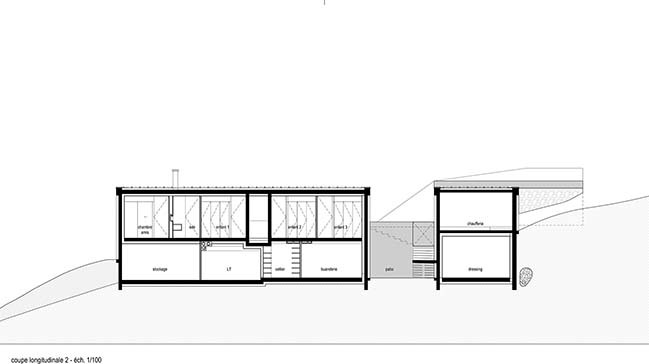 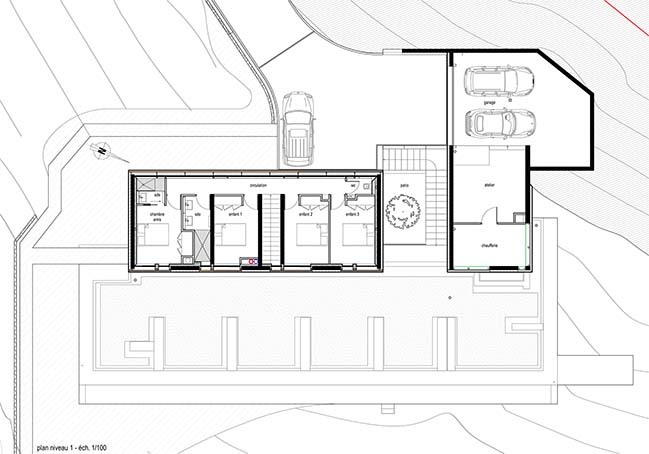 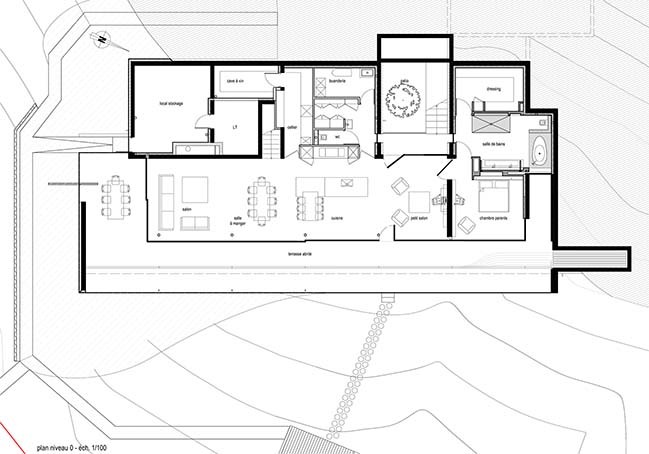 The lower volume, including the master and the living room and kitchen, is completely hidden from the outside eye. 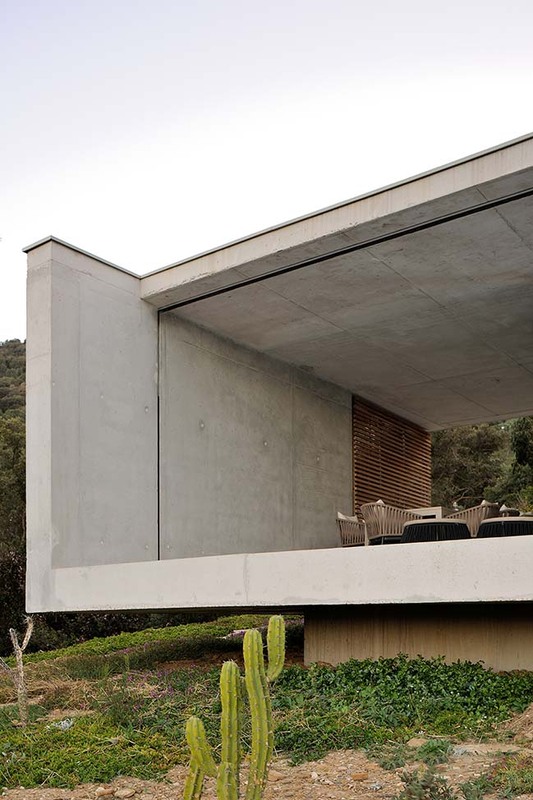 Its simple box shape made out of raw concrete opens to the sea with its fully glazed facade. 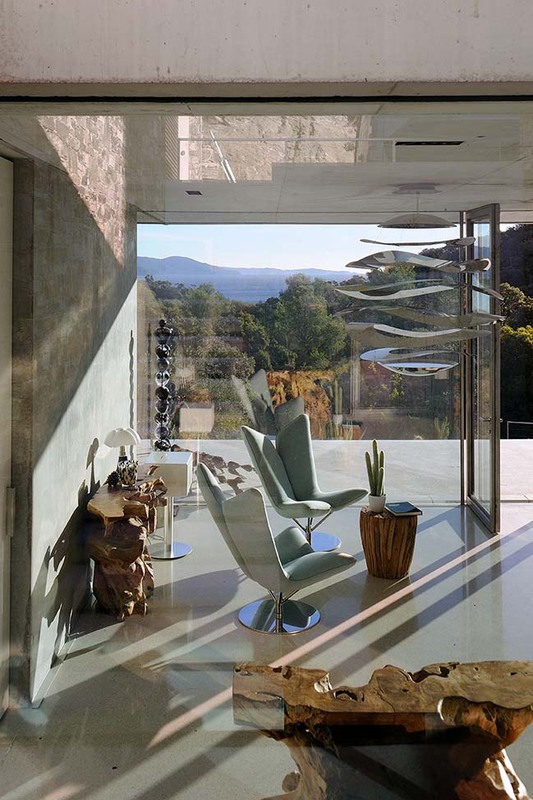 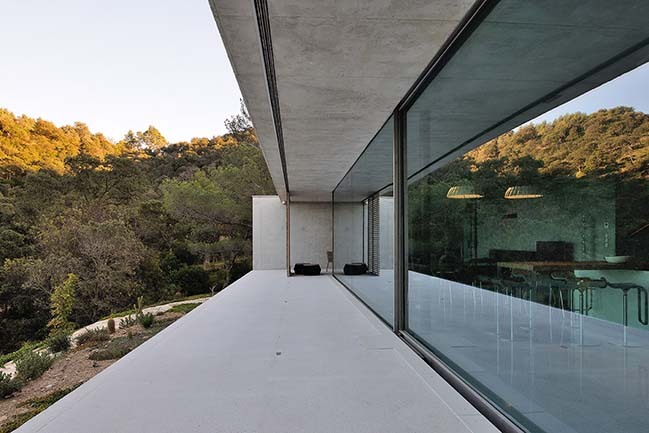 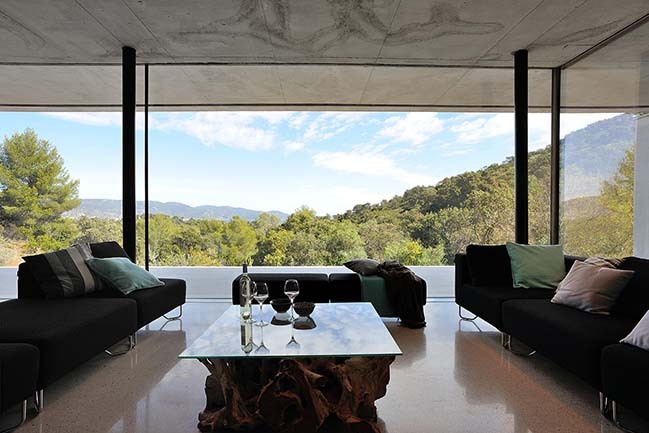 The floor of the box is pulled outward to extend the interior space towards the view - the living room and kitchen can be opened entirely to the terrace thanks to the sliding glass panes. 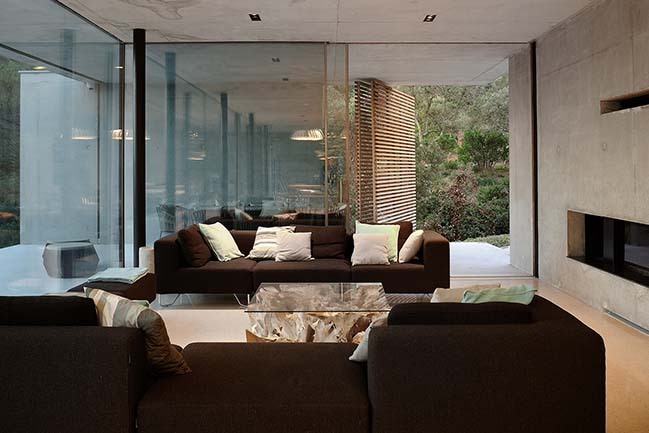 The living spaces thus transform into a summer living room - away from the burning sun but at the same time in the open air. 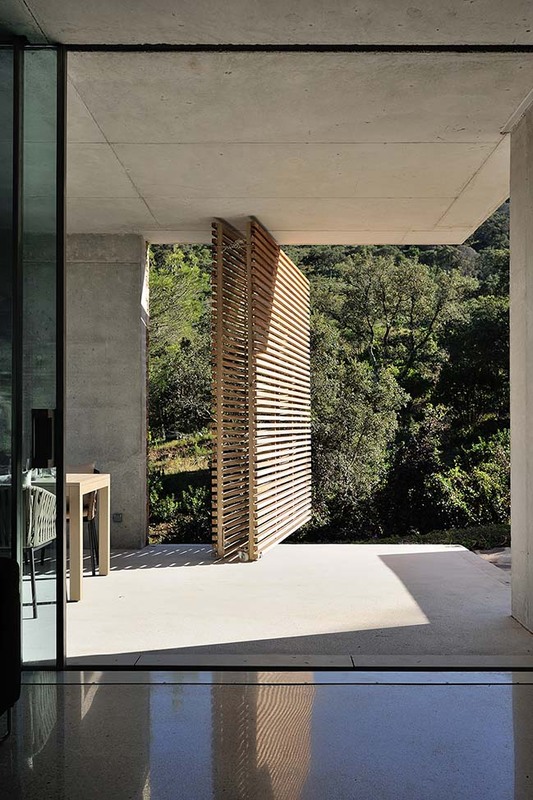 Coupled with the openings of the entrance patio and resulting in a series of natural drafts, a natural cooling system takes place. 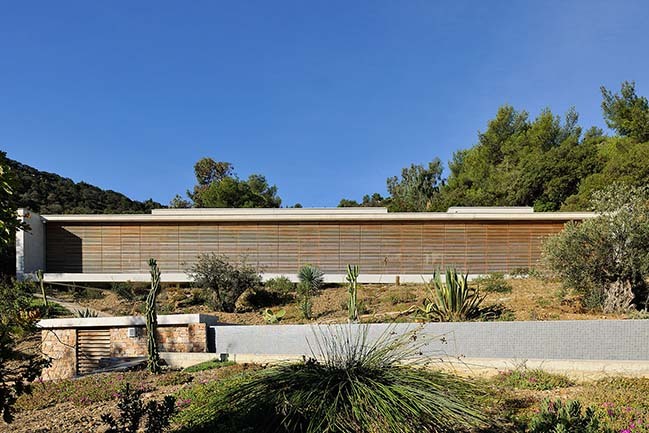 The solar protection of the house is ensured by the way the openings are treated. 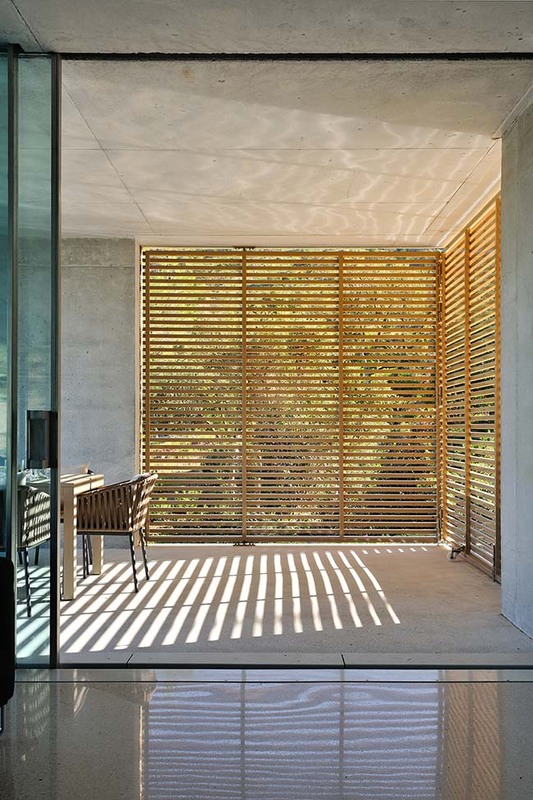 Full-height wooden louvers that adapt to their location and orientation are installed. 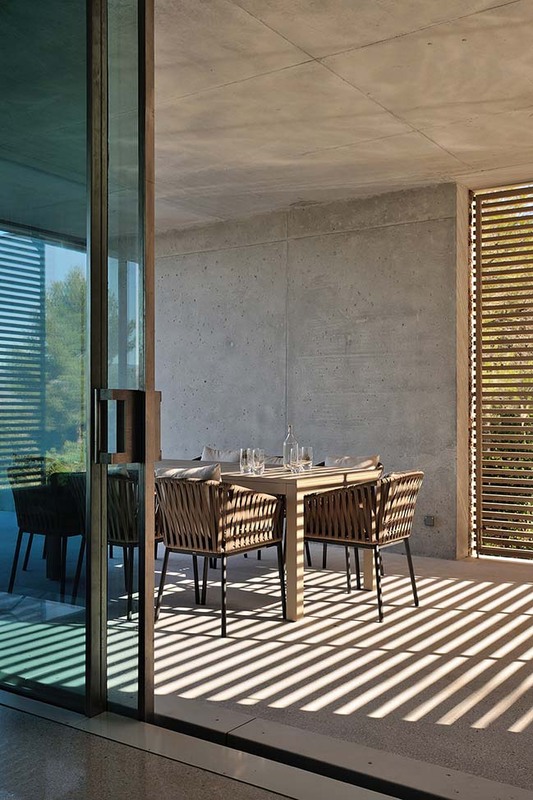 In the upper volume, along the corridor overlooking the forecourt oriented south, the louvers are fixed so as to provide permanent filtration not only of sunlight but also of the strangers’ gaze. 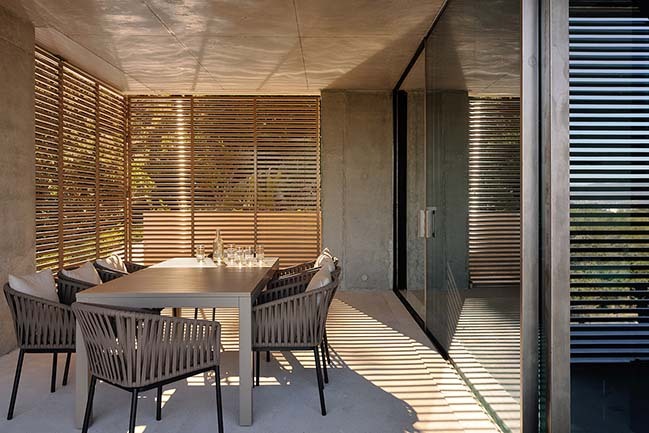 As for the rooms, oriented towards the view and therefore to the northeast, the protection is assured by the sliding shutters. 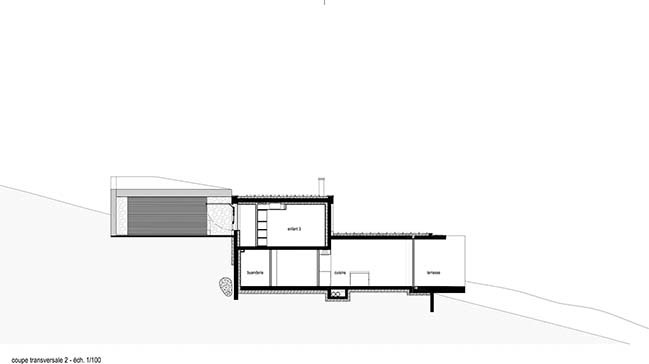 Same idea for the lower volume - the louvers can also be hidden away in order to disappear from view. 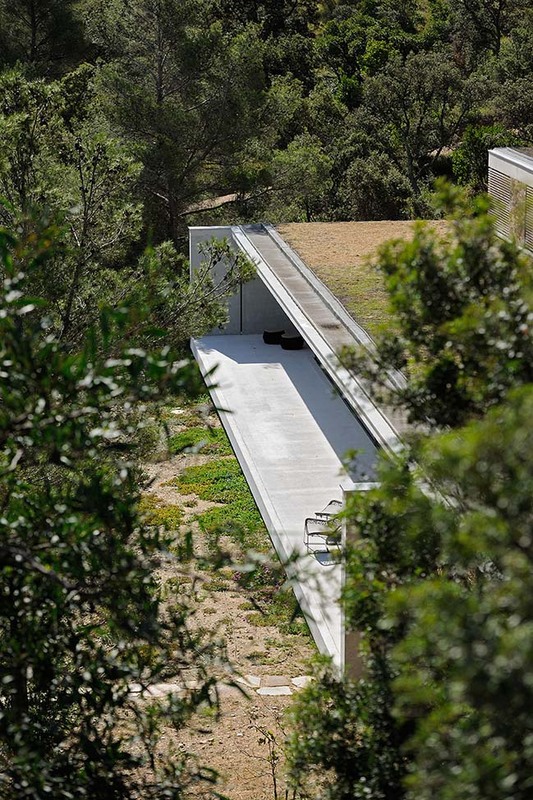 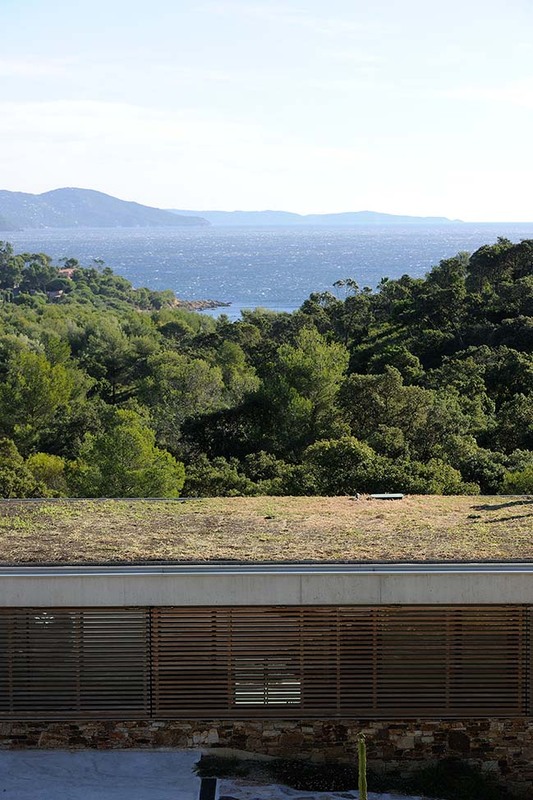 What’s more, the green roof allows a complementary thermal insulation and simultaneously contributes to the integration of the house in its natural site looking below from the top of the site. 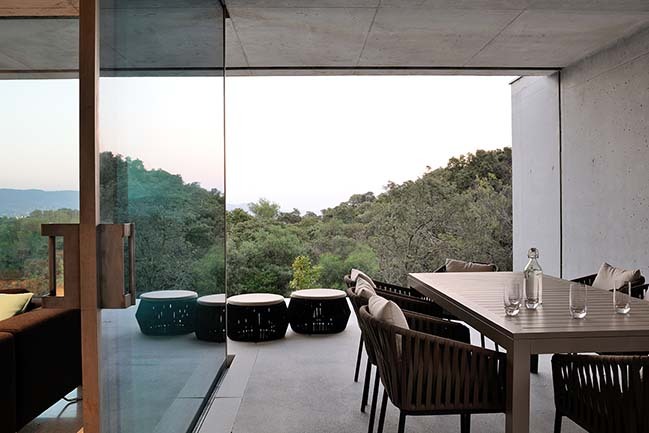 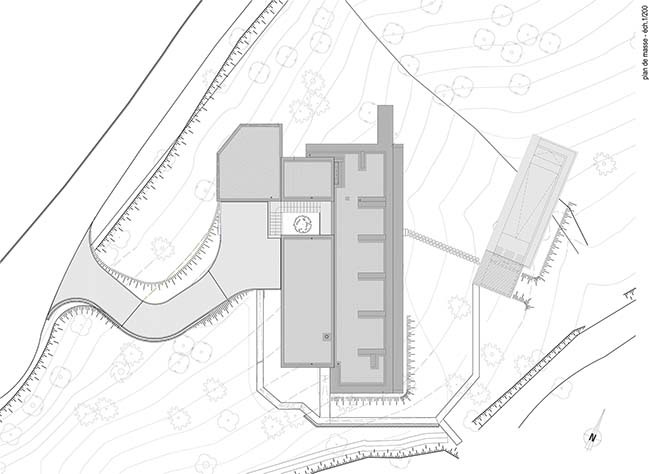 The outdoor spaces of the project push further the insertion of the construction in its site by creating a walk that begins at the forecourt and then develops around the house and the pool facing towards the sea. 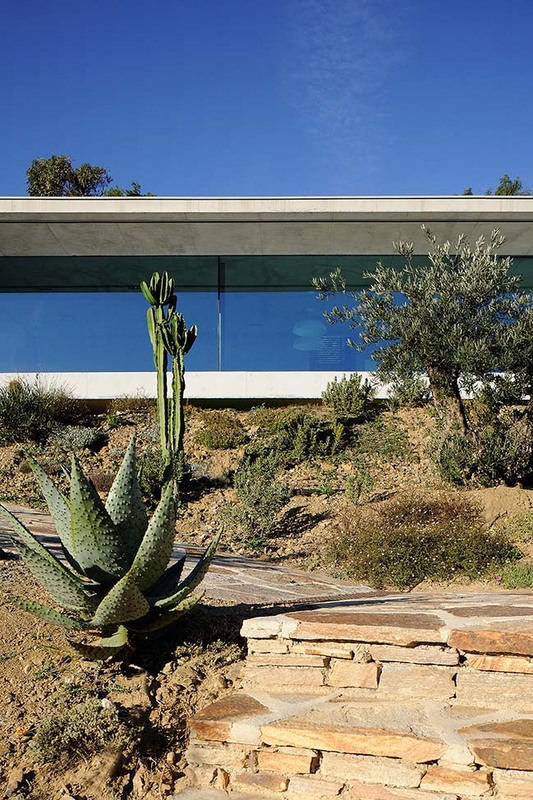 This walk finally disperses in the desert garden exposing with great pride a beautiful collection of different species characterizing the floral diversity of the place.